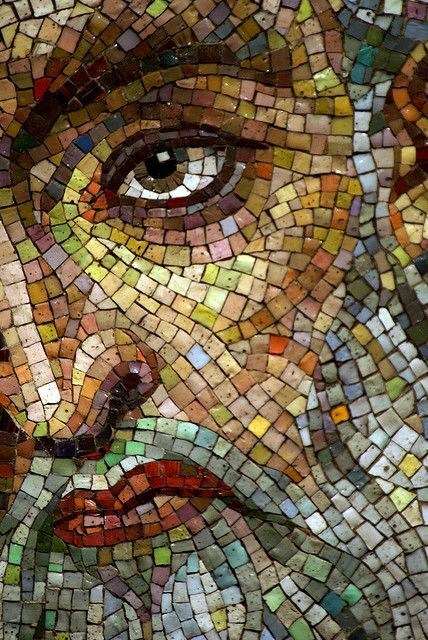 Detail of mosaic of Moses. Cathedral Basilica of St. Louis, St. Louis, Mo. The Cathedral Basilica of Saint Louis, commonly known as the New Cathedral, was constructed in the early 1900s and completed in 1914. Upon the walls of the Cathedral are over 41.5 million pieces of glass with 7,000 different colors (Donnelly). Within these mosaics are stories from the Bible and stories that represent the city of Saint Louis itself. The Cathedral reflects the strong Catholic traditions of the city which at one time was home to 200 Catholic schools in the area. Currently the St. Louis area has 186 Catholic schools including 24 Catholic high schools and several Catholic universities, including Saint Louis University. Catholic education is highly valued among people who live in St. Louis. The Cathedral Basilica helps to share the history of Catholic education in this historic city. Detail of West Wall mosaic. Cathedral Basilica of St. Louis, St. Louis, Mo. 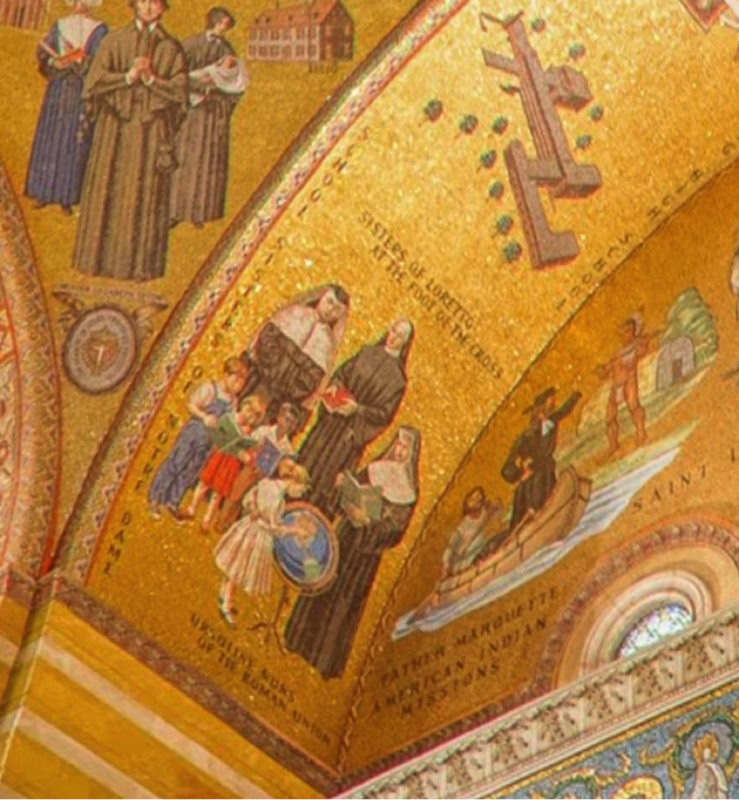 On the far left of the West Wall Mosaic there is a scene of various sisters and nuns educating a group of children illustrating how Catholicism and education go hand-in-hand in the city of Saint Louis. These women each represent a different order in the Saint Louis area responsible for education. The most left of the women reads "School Sisters of Notre Dame." These sisters are responsible for the start up of the grade schools in Saint Louis (Donnelly). The sister shown in the middle represents Nerinx Hall. Nerinx began with three pioneer women - Mary Rhodes, Ann Havern, and Christina Stuart - who in 1812 founded the Sisters of Loretto (Nerinx Hall Website, History). Finally, the most right women represents the Ursuline Nuns, these Nuns are in relation with Ursuline Academy in Oakland, Missouri. Founded in 1848 under the sponsorship of the Ursuline sisters, Ursuline Academy is a Catholic college preparatory school for young women (Ursuline Academy Website, Quick UA Facts). This section of the Saint Louis Cathedral is unique to the space as a whole because it features women. Often times people feel that in the Catholic church women do not play a role anywhere close to men, yet these women were the founders of grade schools and high schools throughout the whole Saint Louis area (a predominantly Catholic city). "Education Wall," Cathedral Basilica of St. Louis, St. Louis, Mo. 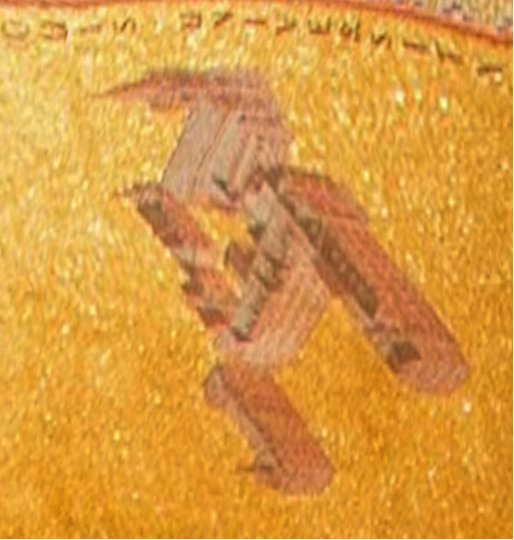 In the center of the mosaics on the "education wall" is a man, Father Peter De Smet S.J., wearing a buckskin embroidered jacket. While exploring down the Missouri River to the Columbia River, he evangelized many Indian Tribes and brought catholicism to Kansas (McNamee). With this, De Smet allowed people to have maps (Pat). De Smet was one of the pioneers for the Missouri Province of the Society of Jesus. Furthermore, De Smet influenced the founding of De Smet High School. On the left side, Father Jacques Marquette S.J is shown in a canoe preaching to the Illinois Indians. He traveled down the Wisconsin River to the Mississippi River and eventually reached St. Louis. Marquette’s mission was to evangelize the Illinois Indians (McNamee). Additionally, Marquette Catholic High School was named after Marquette. On the right side, a diocesan priest from the St. Louis Archdiocese is pictured working amongst the people of Bolivia (McNamee). Further up the right side is the Christian Brothers and the Society of Mary, an order of priests and brothers known as Marianists. The Christian Brothers were founded by St. John Baptist de La Salle, the patron saint of teachers, and is the founder of the Brothers of the Christian Schools such as Christian Brothers College High School, (CBC’s website). The Society of Mary sponsors St. John Vianney high school. Detail of Saint Louis University mosaic. Cathedral Basilica of St. Louis, St. Louis, Mo. Upon entry into the main walkway of the Cathedral Basilica, there is a depiction of Saint Louis University on the upper left archway. Bishop DuBourg’s first acts in Saint Louis was to create an institution of higher learning in the Saint Louis area. Therefore, Saint Louis University was the first institution of higher learning west of the Mississippi River. But Saint Louis University did not start out with this name. Under the leadership of Father Neil, one of the early pastors of the Cathedral, Saint Louis University began as St. Louis Academy in 1818. In 1820, its name changed to Saint Louis College when the college moved to the site of the old Spanish church. At the end of 1826-1827 session, Saint Louis College closed its doors for financial reasons. However, with the spirit of Father Niel, Saint Louis University had its founding 1827 under the direction of the learned Jesuit Fathers (Behrmann). The mosaic of Saint Louis University in the Cathedral Basilica does not include Pius Library, which was added to the campus in 1959 (Donnelly). The mosaic includes the main campus with DuBourg Hall and St. Francis Xavier Church, more commonly known as College Church. Saint Louis University’s representation in the Cathedral Basilica demonstrates how important and monumental the institution’s installation was to the St. Louis area. As the first institution of higher learning west of the Mississippi, the Archdiocese had a lot to be proud of in this achievement. The Cathedral Basilica of St. Louis shows the strong Catholic traditions of the city. Over 200 Catholic schools have been built in Saint Louis which emphasizes that Catholic education is highly valued by the people of St. Louis. Saint Louis University, an institution of higher education, is represented in the mosaics in the basilica. As well as many grade schools that have been split up by genders including Nerinx, Ursuline, De Smet, CBC High School, and Vianney. The Cathedral Basilica helps to share the history of Catholic education in Saint Louis and begins to unravel the important impact a Catholic education has had on the city of Saint Louis. Content researched, written, and compiled by Allison Hallums, Jenita Ikeljic, Hannah Pierson, Jacob Ranalli, and Allison Stapel. Ablen, Mark. “Photos of the Cathedral Basilica of Saint Louis.” Web log post. Rome of the West:. N.p., 28 July 2006. Web. 21 Oct. 2016. “All Schools.” Archstl.org. Archdiocese of St. Louis, n.d. Web. 21 Oct. 2016. Behrmann, Rev. E. H. The Story of the Old Cathedral Parish of St.Louis. St.louis: n.p., 1949. Print. Craughwell, Thomas J. "Cathedrals, Basilicas, and Shrines." Catholic Education Resource Center. N.p., 2007. Web. 9 Oct. 2016. Donnelly, Pat. "Tour of Saint Louis Cathedral Basilica." St. Louis, MO. 2 Oct. 2016. Lecture. Franzwa, Gregory M. The Old Cathedral. Gerald, MO: Patrice, 1980. Print. "History of the Cathedral Basilica." Cathedralstl.org The Cathedral Basilica of St. Louis, 2016. Web. 9 Oct. 2016. History of Catholic Education in the Archdiocese.” Archstl.org. Archdiocese of St. Louis, n.d. Web. 21 Oct. 2016. McNamee, Maurice B. The Architecture and Mosaics of the Saint Louis Cathedral. Place of Publication Not Identified: Publisher Not Identified, 1968. Print. Oetken, August. 1912-1988. Mosaics. Saint Louis Cathedral Basilica, Saint Louis, MO. "The Domes - Cathedral Basilica of Saint Louis." N.p., n.d. Web. 21 Oct. 2016. The St. Louis Cathedral: A Photographic Sketch. St. Louis, MO: Archdiocese of St. Louis, 1948. Print. "Visitors Guide to the Cathedral Basilica of Saint Louis." Great River Road. N.p., 2011. Web. 9 Oct. 2016.